You gotta get your hips into it, man! Are we really that afraid of running into each other’s ‘junk’? Or ‘looking gay’? Get over it! Next time you go in for a hug with another guy, make it real. Take a breath and stay there for at least 3-4 seconds. The guy and the tiger do a good job of modeling this, in the photo above. 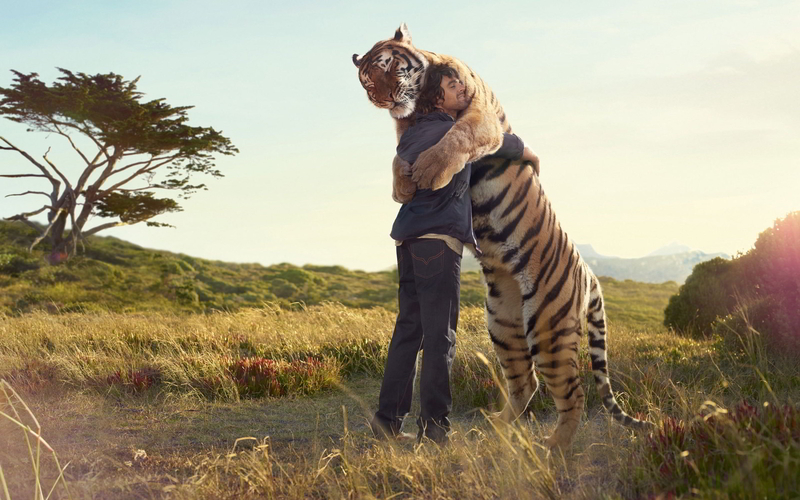 I mean, if a guy and a tiger can give each other a real hug then surely two of us guys can pull it off, too. Nice work, as usual, Dan. I especially liked your comment about hugging, though it is closely related to your other points. A lot of younger people don’t realize that public hugging between men has only been acceptable since the early 1970’s. It became more common as the “men’s movement” began to grow in response to the “women’s lib” movement of the 60’s. In fact, in copycat fashion, it was initially called “men’s lib.” I was in my mid-thirties at that time and when, feeling newly liberated, I reached out to hug my father, he rared back in horror. “I don’t hug anyone but your mother!” he announced. “That’s pansy stuff.” Homophobia was very much alive then, as it is now, but it was much less recognized, and the word itself did not exist. We are in the midst of rapid and profound changes in our understandings about gender. Thanks for sharing your experience here, Larry. Times are certainly changing quickly; and there’s no way I’d be able to hug other men (and talk about hugging other men) so openly if it weren’t for the progress of various social movements of the last century and, in particular, women’s and men’s lib. Both still very important topics, clearly. And I think it’s also time we start talking about human lib! Clear, concise, inspiring. Makes me want to hug a tiger. Thank you. I’ve heard that guys break eye contact more often than women during conversations. I’ve seen that I break eye contact with some guys because I notice that they are not comfortable with prolonged eye contact – so I stop because I don’t want to create an uncomfortable situation for them. Some friends I have, however, its not even something that I worry about. Great article. Just last weekend I discussed “I love you, man”, with a friend. We’ve gotten to the point now, as well as my other male friends, where we say “I love you” at the end of our calls. And it extends to my family too. Telling them I love them, even when they don’t respond, has opened up my heart, and I like who I am for it. Awesome, brother! We’re building a movement, one man at a time. Have you written any books? I come from a rather macho line of military men and am in the military myself. I’m currently a platoon leader and I’ve noticed through my time as an non-commissioned officer and currently as an Officer that misunderstanding and ignorance (I mean that word in a neutral way, not in a derogatory way) leads to my soldiers’ disdain of female and lgbtq peers. I’d like to begin a change in that culture of what I consider to be a toxic idea of what it means to work for a traditionally masculine profession. If you have any books or more articles that you’d think would help, I’d be very interested.